Jean Langlais (15 February 1907 – 8 May 1991) was a French composer of modern classical music, organist, and improviser. His works are mostly masses and organ music, some based on Gregorian themes, enhanced by polymodal harmonies. Langlais was born in La Fontenelle (Ille-et-Vilaine, Brittany), a small village near Mont Saint-Michel, France. 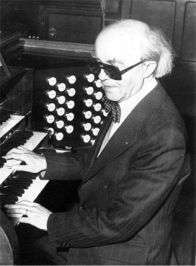 Langlais became blind due to glaucoma when he was only two years old, and was sent to the Institut National des Jeunes Aveugles (National Institute for Blind Children) in Paris, where he began to study the organ, with André Marchal. From there, he progressed to the Paris Conservatoire, obtaining prizes in organ and studying composition with Marcel Dupré and Paul Dukas. He also studied improvisation with Charles Tournemire. After graduating, Langlais returned to the National Institute for Blind Children to teach, and also taught at the Schola Cantorum in Paris from 1961 to 1976. Many of his students went on to become important musicians, including organist and composer Naji Hakim. It was as an organist that Langlais made his name, following in the footsteps of César Franck and Tournemire as organiste titulaire at the Basilica of Sainte-Clotilde in Paris in 1945, a post in which he remained until 1988. He was much in demand as a concert organist, and toured widely across Europe and the United States. Langlais died in Paris aged 84, and was survived by his second wife Marie-Louise Jaquet-Langlais and three children, Janine, Claude and Caroline. Langlais was a prolific composer, composing 254 works with opus numbers, the first of which was his Prelude and Fugue for organ (1927), and the last his Trio (1990), another organ piece. Although best known as a composer of organ music and sacred choral music, he also composed a number of instrumental, orchestral and chamber works and some secular song settings. Langlais's music is written in a late, free tonal style, representative of mid-twentieth-century French music, with rich and complex harmonies and overlapping modes, more tonal than his contemporary, friend and countryman Olivier Messiaen, but related to his two predecessors at Sainte-Clotilde, Franck and Tournemire. Life and Music of Jean Langlais, 2007, Los Angeles chapter of the American Guild of Organists. 1 2 3 "Jean Langlais Website". Jeanlanglais.com. Retrieved 2014-06-24. 1 2 Improviser. "Jean Langlais". Organ Improvisation. Retrieved 2014-06-24.